We've had thousands of members planning trips with our new Points system already and have had some great feedback. It's a really simple service to use and a great way to make the most of your home to pay for your next holiday. Here's an overview of how Points work, and how you can make the most of the system to book more trips. Our Points system is simply an update to traditional home swapping. 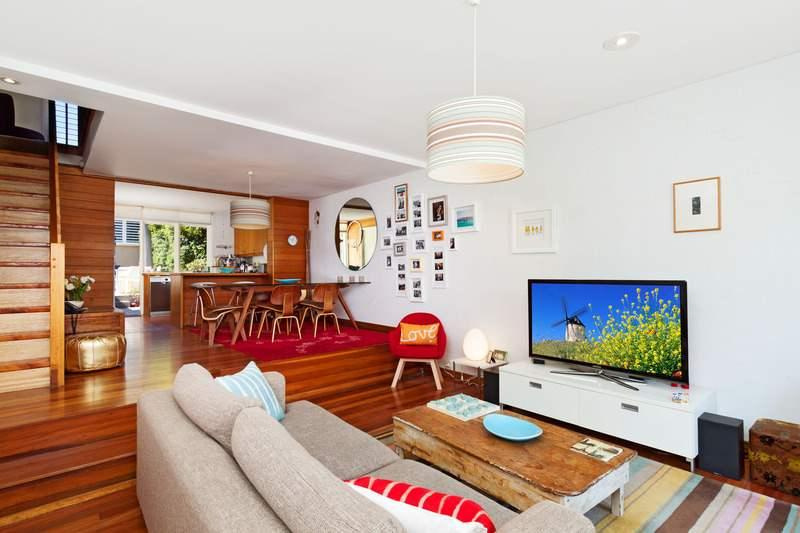 A traditional home swap takes place when two members stay at each other's homes - I come to yours and you come to mine. A Points trip is a swap with an added dimension, giving you more opportunities to plan trips. Instead of having to match up dates and times with another member, you can earn Points when someone stays in your home and then use those Points to stay in another home - anywhere in the world. 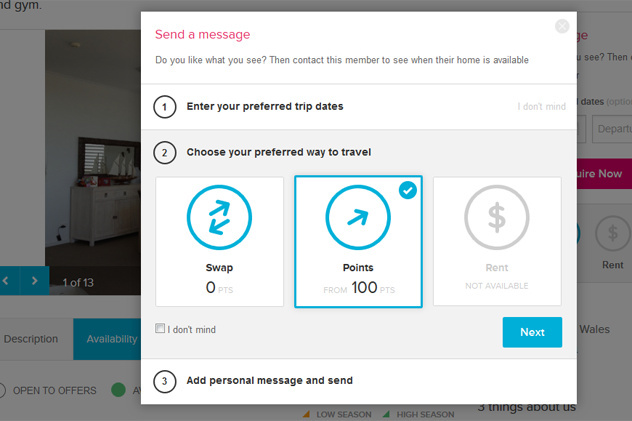 If your home is available and you're receiving requests from locations you're not interested in travelling to, you can now accept the trips and earn Points. You can then use those points at a later date to holiday in your dream destinations. John has a home in Miami and wants to spend two weeks in London. He lets other members know when his Miami home's going to be available by adding the dates to his property's availability calendar. Sarah from Sydney is planning a trip to Miami, spots John's home on the site and contacts him. After chatting they agree the trip and she books to stay in his home using her Points. John receives Sarah's Points and can then use them to book Michael's home in London. John, Sarah and Michael have full control over who stays in their home and where they spend their points, and use our messaging service to chat to each other before agreeing anything. They've agreed holiday accommodation for their trips and it hasn't cost them anything more than their annual membership fee. How do I earn Points to get started? You'll earn points any time you agree to have someone stay in your property on a Points trip. Make sure that you're opted into the Points system in your profile so that your property will appear in Points search results. Then when someone makes an enquiry and you agree the trip with them they'll give you points for the nights that they've booked. The points rate is fixed at 100 per night for all properties. On top of that you'll also receive bonus points when you become an annual member, to welcome you to the club and get you started on your first Points trip. Lite members receive 150 welcome bonus Points, standard members 500 and Platinum members 1000 when they join. So when you become a member you have a potential free holiday waiting for you. 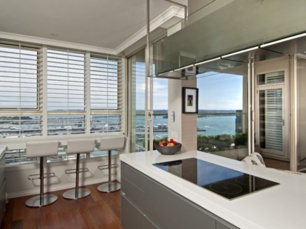 Points is fantastic for second home owners too. You can make your second property available and earn Points each time a member books to stay there. Then use those points to travel and never have to pay for a hotel room again. How do I find homes that are available on Points? Our search feature on-site now allows you to specify that you're looking for Points trips. Simply select 'Points' from the drop down box, put in the dates you're looking for and hit search. When you make an enquiry about a member's home, simply select the Points option under 'preferred way to travel'. This option will only be available if you have Points to spend and the home is available on Points. I'm keen - how do I make sure I'm opted into Points? Members can choose to opt in or out of the Points system in their personal preferences section of their profile. 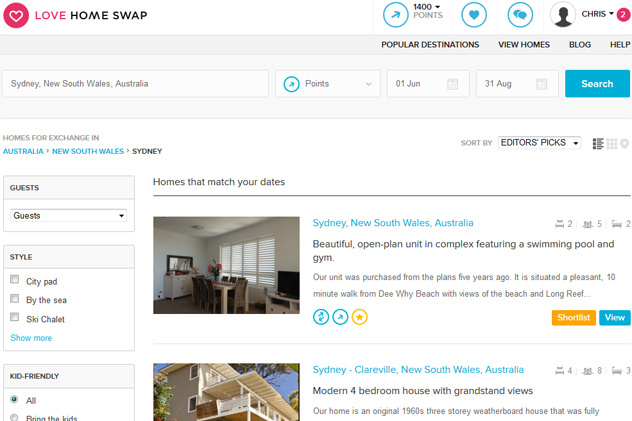 Log into the site and head over to your profile page to choose your preferred ways to travel - Swap, Points or Rent. Read more about Points in our FAQs section or drop us a line if you have any other questions.